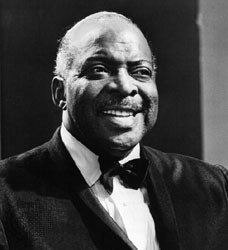 William "Count" Basie was born in New Jersey in 1904 and studied the stride piano style. He moved to Kansas City and became the pianist for Benny Moten's orchestra. When Moten died in 1935, Basie took it over. The Basie Band defined the Kansas City/Southwestern style in the 1930s. The band really swung, with a rhythm section that was well ahead of it's time. The tunes used a lot of "riffs" (short, musical phrases exchanged between sections), call-and-response, and plenty of space for soloist to strut their stuff. 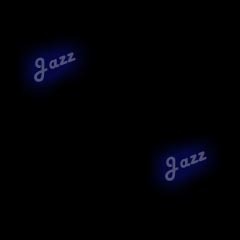 Basie's piano style exemplified the "less is more" theory. Basie's bands featured such superstars as Lester Young (featured saxophonist), Buck Clayton, Jo Jones, and Don Byas. Basie was a smart leader, and showed it in the 1950s, when the Big Band business dried up. Basie responded by disbanding his orchestra and forming a sextet and touring. He continued to have a keen eye for talent, bringing aboard talents like Eddie "Lockjaw" Davis, Frank Foster, Thad Jones, and Johnny Newman. He later formed an octet and his bands backed such famous singers as Frank Sinatra, Tony Bennett, Sarah Vaughn, and Billie Eckstine (I have the Sinatra collaboration -- produced by Quincy Jones -- it is most excellent!). Basie died in 1984, but his band continues to tour today. I have seen them twice, and they are worth seeing!